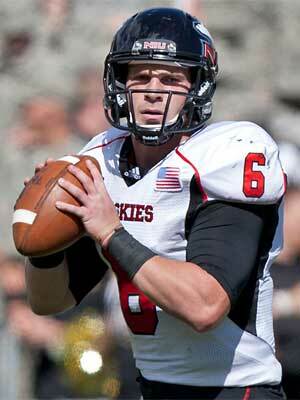 Northern Illinois University quarterback Jordan Lynch (Chicago, Ill./Mt. Carmel) was named Mid-American Conference West Division Offensive Player of the Week after leading the Huskies to a 41-40 victory over Army, the league office announced Monday. Lynch passed for a career-high 342 yards and four touchdowns while completing 18-of-27 passes. He hit going 6-of-8 passes on the Huskies’ game-winning drive in the fourth quarter. His 342 passing yards is the seventh-highest single game total in school history, while his four touchdown passes tie for the eighth-most at NIU. The junior signal caller added 125 yards rushing on 13 carries, including an 88-yard touchdown run. The junior totaled 467 yards of total offense on the day, which ranks third all-time at Northern Illinois, and was responsible for five touchdowns. Lynch hit Martel Moore from eight yards out for the game-winning touchdown pass with 4:29 left to play. He connected with Moore earlier in the game on a 31-yard TD and threw a 69-yard touchdown pass to Tommylee Lewis. The league honor was not the only award Lynch earned this week. The Chicago native is also one of four players competing for the ESPN.com Capital One Cup Performer of the Week. Fans can log on to espn.com/capitalonecup to vote for Lynch. He is also one of eight quarterbacks named a Manning Award Star of the Week. Fans can log on to the Allstate Sugar Bowl’s Facebook page, click on Lynch’s photo and “like” it to vote. The Mt. Carmel product was selected as the College Football Performance Award National Performer of the Week and National Quarterback of the Week. For more information on NIU football and Huskie athletics, visit www.niuhuskies.com.